Holy cow-this is brilliant! Thanks for sharing! You are a genius. I am so going to use this idea. I have stepped on a couple of puzzle pieces and put them up because I felt like they were just going to get lost. NOT ANYMORE. Thanks! You are so smart! I love this. Now I can keep some of my kiddo’s things organized. We have cubbies, we have drawstring bags, we have messes:). I guess that is what I get for having my two little sweethearts share a room. They are lovely little ones, but they can be messy tornados. Thank you for helping. Finally made some today! Thanks for a great idea! This. Is. An. Awesome. Idea! Totally going to copy you. Brilliant! You just made my life so much easier. I don’t make comments enough but thank you for so many great ideas. Fabulous! I'm going to start doing this tonight! Thank you so much for the idea!! I have those same puzzles! This is SUCH A GREAT IDEA!!! I am hearing Angels singing. What a great idea. We are always getting pieces mixed up and it drives me NUTS. total genius! If I can find all the pieces to the puzzles, I'm soooo going to do this! what an awesome idea…i've got to make one for all of our puzzles! You're a genius! I really enjoy your blog!! My goodness. I found this just in time. We are about to move to a new State and my son loves puzzles. Sometimes just the pieces. Sometimes just the boards. and Sometimes he even likes to put the puzzle together. I had no idea how I could pack them so that they would be nice to open again. I was even considering wrapping them in saran wrap! This is much for clever, and permanent, for that matter. And he will love putting them and dumping them out. dumping is great fun. This is a GREAT idea!!! Thanks MUCHO! Ah!!! This is genius! Totally doing this. Thank you. I love this idea! I am featuring it on my blog! I'm fascinated by your blog. Siging up to follow you now. Love the puzzle pocket. Solves our crisis of missing puzzles pieces. Ok, duh! What a completely genius but yet common sense idea! We have puzzles up the wo-ho and finding all the right ones is always a challenge. Excellent tip! Thank you very much for sharing this superb idea, I having putting them in individual bags and often pieces go missing. I tried, and may I mention, LOVED this pin today for some toddler puzzles – the ones with handles on them. 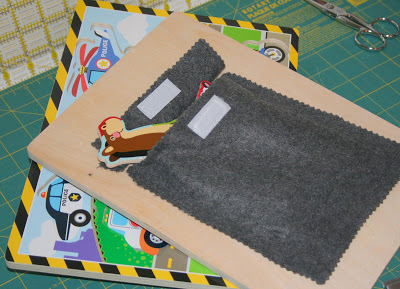 After adding 2 – 3 inches to the width of the felt, I glued the pocket down gathering it at the bottom. This left plenty of room for the pieces. Awesome idea! Thank you, Allison! I always put the finished puzzle in a large ziplock bag, and that way it stayed flat and would stack.